The Old Foodie: From Jujubes to Jelly Babies. The Doctor Who series premiered on BBC TV on this day in 1963, giving us a fine opportunity to test the theory of a maximum three degrees of separation between any event or person and a specific food item. The theory is proven by the fourth Doctor (played by Tom Baker from 1974 – 1981) who, as I am sure you well know, had a penchant for jelly beans. I am reliably informed that Jelly Beans are food, and they are a fine topic for this day if for no other reason than to provide a distraction from The Turkey (and a happy Thanksgiving to all of you “over there”). 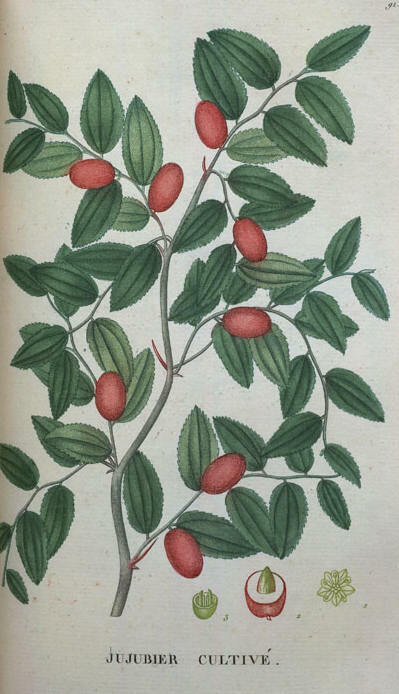 In the beginning, in North Africa and Syria was the Jujube tree (Ziziphus zizyphus), whose edible, berry-like fruit has a decidedly un-berry like mucilaginous texture. This peculiar texture was found to be soothing to sore throats and the like, hence its adapatation to medicinal use in early times. As tends to happen with exotic imported ingredients, supply did not keep up with demand and apothecaries set about copying the shape and texture of the dried fruit by using other more easily obtained plant-derived gums such as gum arabic. The therapeutic jujube lozenge or pastille was born, and it was good because it was sweet. Because it was sweet, it was appealing outside of its medicinal indications, and so it became gum candy. And gum candy in its turn morphed into many forms such as gummy bears, snakes, frogs – and babies. To be specific, Jelly Babies were first produced by Bassett’s in Sheffield in 1919. Originally they were called “Peace Babies”, coming off the production line as they did after the end of the war. They became very popular, and many other companies produced them until the next war came along and production of all confectionary ceased due to sugar rationing. Much in the style of Doctor Who himself, the Peace Babies were reborn as Jelly Babies in 1953. One intriguing story (perhaps it is urban myth) about jelly babies is that “research” has shown that women with children are more likely to bite the heads off them first, whereas childless women are more likely to eat them whole. Interpret as you wish. One important fact about jelly babies is that “genuine” ones are slighly powdery from the cornstarch used to dust the moulds before the gum is poured in. This is elegantly demonstrated in the following recipes taken from ‘The Italian confectioner; or, Complete economy of desserts …’ by William Alexis Jarrin (1827). Should you wish to use the recipe to make your own chewable children, you will not need to perform the final step of encasing the gum in “candy” as this would give you something like jelly beans, not jelly babies. The tricky part will be the carving of jelly-baby shaped holes in the starch powder in your box. Take some of the finest and whitest gum arabic, dissolve it in a sufficient quantity of orange-flower water. To every pound of gum, add two ounces of crystallized sugar; reduce it in the bain marie to a very thick consistence, similar to jelly, without stirring or moving it, which would hinder it from being transparent; procure a small box of about half an inch in thickness, and fill it with very dry starch powder, and make some small holes in it, of the same size as you wish the pastilles to be; then fill these small holes with your paste, and put it in the stove to dry; when dry, wipe all the starch off perfectly clean, and put them in candy like any other objects. The story for November 23rd 2005 was "The Roast Beef of Old England". One grows tired of jelly babies Castellan. One grows tired of almost everything, Castellan, except power. The Doctor, in The Invasion of Time. I confess, I always bite the head of first. Can't remember if I did pre children.